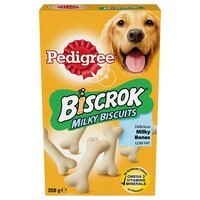 Pedigree Milky Biscuits are seriously crunchy and delicious biscuits that are rich in calcium and has a mouth-watering taste that dogs will love. Milky Biscuits have been specially made for maximum taste and enjoyment with less than 5% fat. These bone shaped milky treats are filled with Omega 3 and vitamins. Ingredients: cereals, minerals, various sugars, oils and fats, milk and milk derivatives.